Washington D.C. is always a great place to visit, but has particular significance on this day to remember those who fought in the country’s armed forces. Several sights stood out. The Vietnam Veterans Memorial Wall was designed by Maya Lin, made up of two black marble walls dramatically joined in two triangles that chronologically list the names of more than 58,000 soldiers killed or missing in action. Sunday morning, there was a long line of people waiting to view the triangular shaped walls. There were flowers, mementos, letters, missing in action notices, army boots on the ground above where the names were listed. Some in the line walked slowly, pausing to reflect while others identified specific soldiers, possibly friends, family members, or fellow soldiers. The somber memorial personalizes the conflict with the names etched into stone. 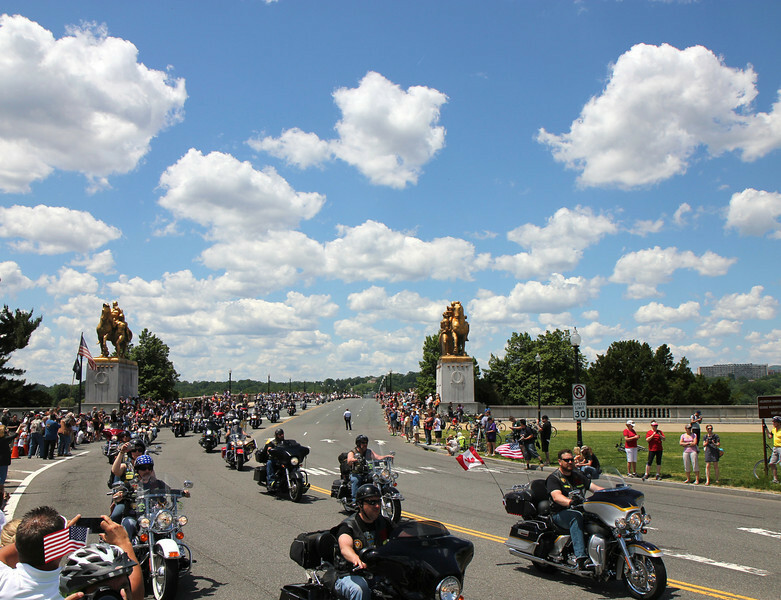 The second memorable attraction was the Rolling Thunder motorcycle parade. The rally is held annually to call for the government’s recognition of Prisoners of War and Missing in Action. The rally started in 1988. The rally attracts hundreds of thousands of bikers and takes over four hours for all of the bikers to finish the parade route. An impressive array of patriotic bikes were on display as they worked their way around D.C.
As I look back, several veterans stand out for me. First my uncle, Ira Richter, was in World War II. As a flight engineer, he flew hundreds of supply missions into China, over a treacherous route called The Hump. The Japanese cut off all sea and rail access for supplying China, so an airlift was devised. Flying the Hump was a hazardous route over the Himalayan Mountains, winding through north Burma and west China where violent winds, icing, and bad weather were every day hazards. Many perished. Second, I remember a kindergarten or first grade classmate growing up in Topeka, Kansas whose father was killed in the war. At that age, I couldn't understand the war and didn't know the boy well; I could only imagine how sad the boy was at the terrible loss of his father. Standing in line at the wall on Sunday, I looked for the name of the boy’s father. With the help of a Park Service worker with a catalogue of all the names on the wall and location, we were successful in finding the name on the wall: Richard J. Sasek. According to the link, he is buried at Arlington National Cemetery. These are just two examples of the countless men and women that have served and have sacrificed so much in defense of our freedom.